Guest seek more healthy and vegetarian dishes every day. Serve this simple but delicious dish on your Ramadan menu. Wash, pat dry and cut both ends of okra and cut into 1" pieces. Heat wok with oil and sauté okra until light golden brown and soft, keep aside. While frying okra, finely chop onion, green chilli and coriander. In a same pan add remaining oil, add cumin seeds and allow to splutter. Now add onion, green chilli, ginger-garlic paste and sauté until onion becomes soft or light brown. Now add red chilli, coriander seeds, turmeric powders & kasoori methi, mix well. Add tomato paste, Knorr Vegetable Stock Powder and cook cover until tomato gets mashed. 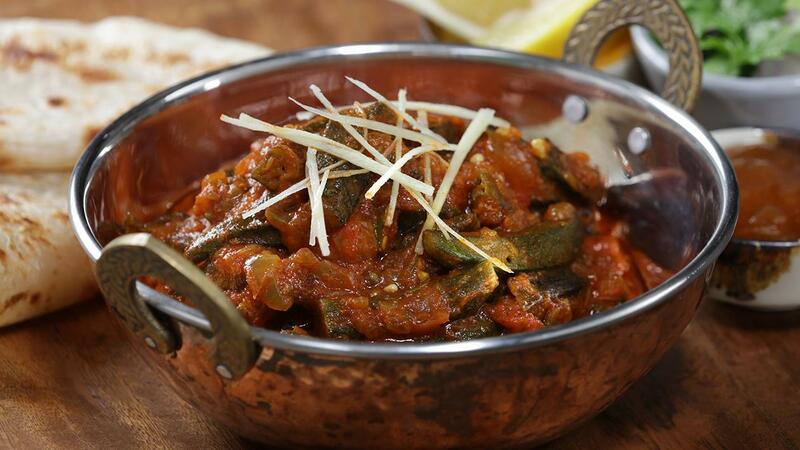 Add okra/bhindi and mix well, cover and cook for 12-15 minutes in medium to slow flame or until okra gets cooked. Add garam masala, mango powder and mix well, cover and cook for another minute, add fresh coriander and serve. Garnish with julienne ginger. Serve with Paratha, mango chutney and fresh lemon.